As a person who works in the communications field, there are a lot of little things that bother me about social media, but one in particular has become particularly bothersome lately- accounts that I follow posting content that is not relevant. What I mean by relevant is that these accounts, often run by large organizations that should know better, posting content that has nothing to do with their core business. The prime example I can think of this is something that has been brewing amongst three Canadian Football League teams, the Toronto Argonauts (@TorontoArgos), the Ottawa RedBlacks (@REDBLACKS) and the Edmonton Eskimos (@EdmontonEsks). The employees responsible for running these accounts have started a content piece called #MemeWarMonday. If you are not familiar with what a meme is, it is ‘a humorous image, video, piece of text, etc. that is copied (often with slight variations) and spread rapidly by Internet users’. Memes are the social media equivalent of the e-mail forwards you would receive about 10 years ago from distant relatives and annoying co-workers. The best way to describe what you get during these meme wars is to check it out yourself via this CBC Sports article: http://www.cbc.ca/sports/football/cfl/cfl-teams-introduce-memewarmonday-1.2875470. This is where relevancy comes in. As a communicator for a football club, what do you think your followers would want to see or read? Perhaps the latest roster updates, historical facts and pictures or video, or maybe behind-the-scenes features with the team’s players? I know these are definitely reasons why I follow sports team. Would I follow them for Internet memes and kids shows from the 90s? Not likely, since there are a bunch of other social media accounts and websites where I can see that stuff. I know in the age of Wal-Mart and Amazon so many businesses and communicators try to be everything to everyone, especially with the pressure to see increased ‘engagement’ amongst fan bases, but is that increased engagement worth alienating your loyal followers and fans? This is not to say don’t have a sense of humour and not engage the ‘lolz’ aspect of social media, but do so carefully while making sure your content is still relevant to your target audience. For those of you who know me, you know that I love data and numbers. My undergraduate degree was Business & Economics, and I certainly loved analyzing data and running regression analysis. Enough about me, let’s talk about Twitter Analytics! 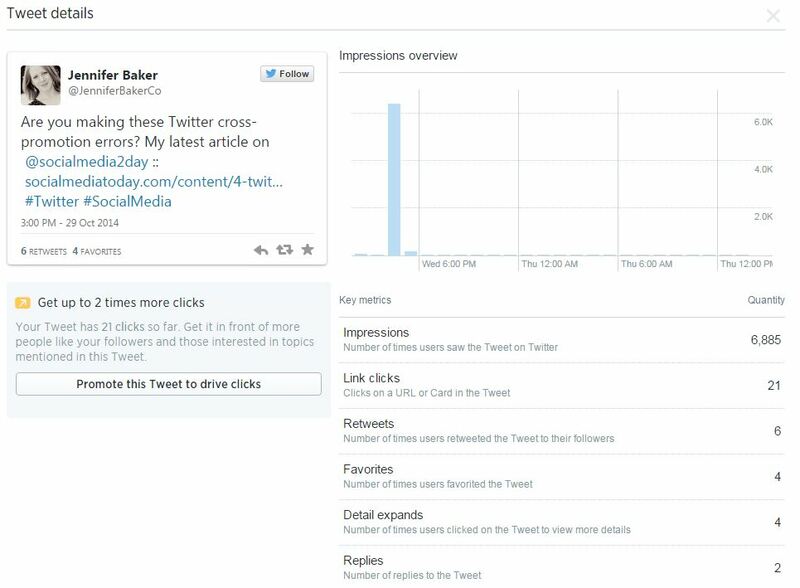 This past year Twitter rolled out analytics for all Twitter business accounts (aka. advertisers, and potential advertisers) for the purpose of understand the impact of their accounts. Previously, Twitter users relied on data from third-party sources, or worse, nothing except follower count. While my account @JenniferBakerCo has ~1,500 followers impressions per day (August-November) can range from 652 up to 1.3k. 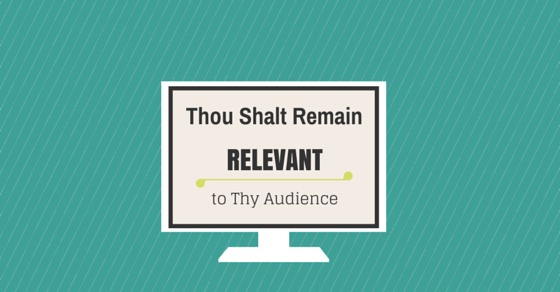 While you may have 10,000+ followers, are they engaging with your brand? Each month provides an overview of your engagement rate (e.g. the number of clicks, retweets, replys, follows, favourites divided by the total number of impressions). A higher rate is better! As for the remaining analytics, they account for the number of times links have been clicked, tweets have been retweeted, or replies your account received during the month. @JenniferBakerCo received a higher than average number of link clicks, retweets, and replies during October. It was during this month that @JenniferBakerCo received a RT from @SocialMedia2Day, which resulted in 6,885 impressions and 37 engagements. Furthermore, during the same month, @JenniferBakerCo received a RT from @BrockUniversity, which resulted in 3,839 impressions and 34 engagements. @JenniferBakerCo had a higher than average engagement rate during November due to the photos shared on Remembrance Day. 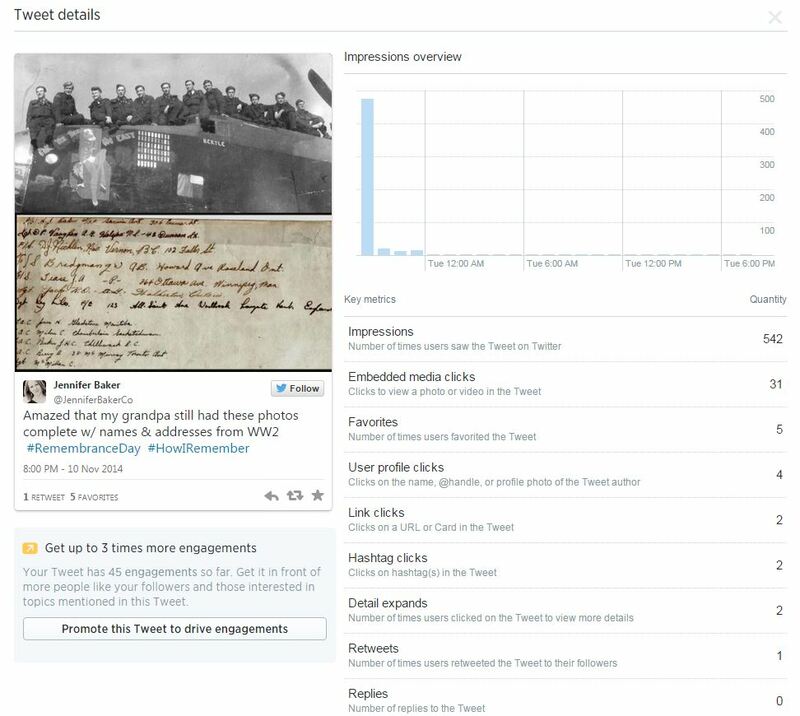 Once you’re done viewing tweet activity, users can view the growth progress of their account. 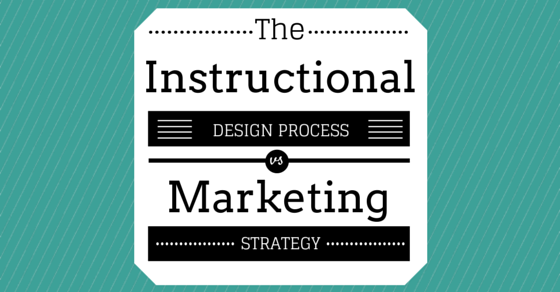 In addition, users can gain an understanding of their followers. 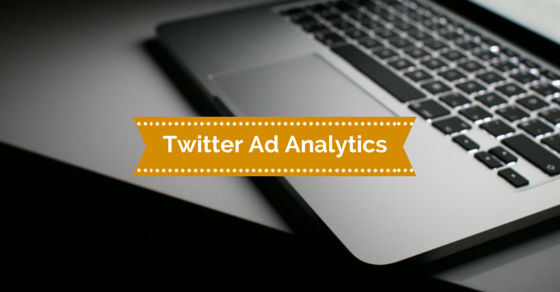 Twitter analytics allow users to view popular interests, location, and gender. For example, accounts that follow @JenniferBakerCo, they are most interested in marketing (25%), leadership (21%), and Canada (18%). In addition, 77% of followers are located in Canada, followed by USA (12%). Finally, it is estimated, 60% of followers are male. 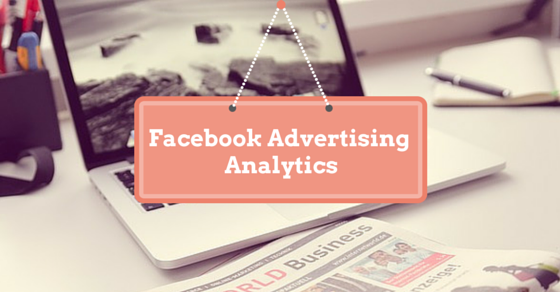 Over the last year Facebook has been working diligently to improve analytics associated with advertisements. If you haven’t taken a look at the back-end of your advertising campaigns, you may be missing out! Advertisers can create custom advertising reports for the purpose of understanding what aspects of their campaign did (or didn’t) work. Below: The General Metrics highlight basic information including number of impressions (i.e. the number of times your ad was served), reach (i.e. the number of people your ad was served to), frequency (i.e. the average number of times your ad was served to each person), and unique clicks (i.e. the total number of unique people who have clicked on your ad). In the screenshot below, there are six unique ads running, each with up to six sets per each. Advertisers can click “Customize Columns” to create a report complete with the information they require for items including, performance, engagement, videos, website conversions, apps, events, clicks, and settings. There are 150 options for analytics, so it will take time to read through and understand what you require. Included in “Customize Columns” is where advertisers can update their “Attribution Window,” the small box on the home page that updates you on your current advertisements. Advertisers can dig deeper to find out which demographic is responding to the advertising campaign. The information from the previous report is segmented based on gender and age, allowing advertisers a clear idea of what demographic is interested. Not only do we know how many people are seeing the ad (reach), but now we know if they were male or female, and their age. The example below has focused on one of the six ads from previously. In this case you’ll notice that the ad was focused on women only. In addition, you’ll notice that the greatest reach (2,041) was to women aged 55-64, but the greatest frequency (9.27) was women aged 65+. As a result, the greatest number of clicks (21) was acquired from women 65+. You’ll also notice that the least active group was women 18-24. While creating reports can be a fun task, it can be time consuming to create and update reports when you need them. 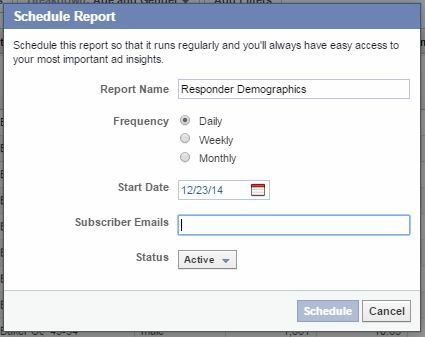 Opt to set-up and schedule advertising reports right to your inbox, and when you need them! Create a name for your report, set the frequency (e.g. daily, weekly, monthly), and start date, then click “Schedule”. If you’re running multiple campaigns, consider setting up a report weekly, or monthly to ensure they you keep track of progress. When you’ve got a free minute (or two) take a moment to go through the analytics associated with your advertising account. 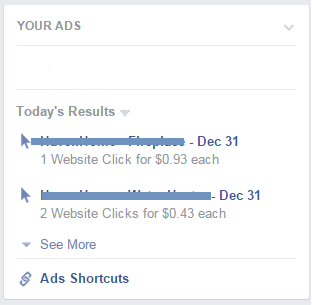 Note: If you’ve never purchased paid advertising on Facebook, this screen will not be available to you. Good luck!